For my stop, Rafael & Jorge sat down to chat with Craig Thompson, author of Space Dumplins (maybe the cutest name ever), which I do hope you'll enjoy. But before you dive in, I encourage you to check out the CBW website and list of events, so you can see if there's anything happening in your area (and get involved! ), and even more so, I encourage you to share your favorite books with kids in your life, not just during the yearly Children's Book Week, and not just during the month of May, but always, at absolutely every opportunity that comes your way. . .
RAFAEL/JORGE: Hi, Craig, how nice to cyber-meet you. Thanks so much for answering some of our questions. QUESTION (FROM RAFAEL): I’m a big fan of your Carnet De Voyage book, and I’m super excited about your collaboration with Baudouin. How did that project come about? Edmond Baudoin and I first met at a comics festival in the Netherlands in 2004, on the tail end of that trip documented in CARNET DE VOYAGE. He spoke no English, I spoke no French, but despite the language barrier, age difference (he’s 33 years older), cultural differences, we instantly bonded as likeminded creative spirits. A decade later, we decided to collaborate on a book and explore both the differences and overlap in our work. QUESTION: You had a long development process for "Blankets," and "Habbibi." Was it the same for the new book? SPACE DUMPLINS was written quickly - in a span of three months, including revised drafts, and the process was completely enjoyable. The drawing, however, was just as time-consuming and exhausting as any other book. It took a solid two years to draw the 300 pages. In contrast, it took a full year to write BLANKETS and two years to draw almost 600 pages. HABIBI was the roughest of all - TWO years to write, and FOUR years to draw. QUESTION (FROM RAFAEL): I really dig the way you drew "Space Dumplins," doing your pencils on a Cintiq, but inking on paper (I penciled/inked "Giants Beware" and "Dragons Beware" on a Cintiq). Can you talk about your decision to draw it this way, as opposed to doing it all digitally? Truth be told, if time wasn’t an issue, I’d do it the way you’re doing! The first three chapters of SPACE DUMPLINS were all penciled on paper, but I often found myself drawing panels on separate pieces of paper, then cropping and collaging them on a page in Photoshop - which is the way Art Spiegelman works these days, I believe. At that point, it became easier to just “pencil” on a Cinitiq in MangaStudio, which has infinite possibilities for editing composition, then print out blue lines on actual paper. For me, it was important to maintain the tangible, analog side of the process by inking the final lines on paper with India ink and a sable brush. I can’t bear spending all my creative hours on a digital screen. QUESTION: What are you working on next? Any more collaborations with other super-star Bande dessinée artists? The collaboration with Edmond Baudoin is my next project. We started on it last summer when I spent two weeks with him in the mountain top village in the south of France he grew up in. This summer, he’s visiting the States and we’ll do the All American Road Trip - from LA to Wisconsin, my home state - hitting the important national monuments like Moab, Zion, the Grand Canyon, Yellowstone. Neither of us have been to those places, and we’ll document it all in drawings. The book will end up being a cross between BLANKETS and CARNET DE VOYAGE. HITCHHIKER’S GUIDE TO THE GALAXY is on the nightstand, because I gotta keep bedtime reading light, and Douglas Adams’ sci-fi comedy has been great inspiration for SPACE DUMPLINS. During daylight, I’m reading Cormac McCarthy’s SUTTREE. Find more of the Kids Comics Q&A tour here! Highly acclaimed graphic novelist Craig Thompson's debut book for young readers about a plucky heroine on a mission to save her dad. For Violet Marlocke, family is the most important thing in the whole galaxy. So when her father goes missing while on a hazardous job, she can't just sit around and do nothing. To get him back, Violet throws caution to the stars and sets out with a group of misfit friends on a quest to find him. 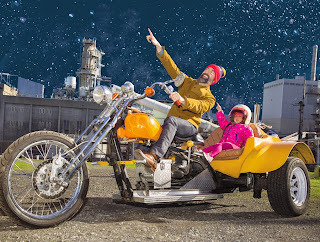 But space is vast and dangerous, and she soon discovers that her dad is in big, BIG trouble. With her father's life on the line, nothing is going to stop Violet from trying to rescue him and keep her family together. Visionary graphic novel creator Craig Thompson brings all of his wit, warmth, and humor to create a brilliantly drawn story for all ages. 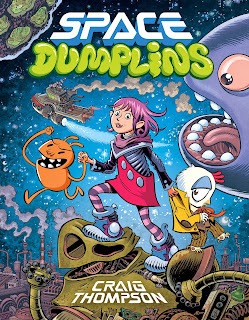 Set in a distant yet familiar future, Space Dumplins weaves themes of family, friendship, and loyalty into a grand space adventure filled with quirky aliens, awesome spaceships, and sharp commentary on our environmentally challenged world.